"Number please". I expect most people now living in Canning and surrounding hamlets have never heard that cheerful greeting from the local Maritime Tel and Tel switchboard operator when making a phone call. The Telephone Office was situated in the building at 9806 Main Street now owned by the Canning Library and Heritage Society, and being a volunteer at the Library now brings back lots of memories; for instance, one recent late fall evening when Wilma Gibson had to go to the basement to adjust the now modern oil furnace, I recalled having to go down to that scary place as an 18 year old and shovel coal into an evil-smelling coal furnace in the wee hours of the night when I was working alone. Much has changed. 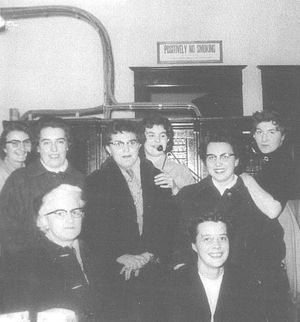 There were eight operators working 24-7 in rotating shifts and a permanent night operator during the 1950s when I worked there. Mrs. Robert Woodburn was night operator for many years. It was on her days off that we younger girls had to take our turn on the night shift. Along with operating the switchboard we performed several other duties. We were responsible during the absence of the Chief operator to look after the cash and take telephone bill payments. We were also responsible for the fire alarm for all local emergencies and thinking about it I can see that as almost an impossible task because sometimes we worked alone and someone had invented a system of multiple blasts of the fire horn to give local firemen an indication of where the fire was located. I believe there was one blast for out of town, and two, three and four blasts for different directions. If a fire call came in when we were working alone we had to go out back and ring the alarm the required number of blasts, hoping that we had them memorized correctly. Meanwhile it was mayhem back at the switchboard when the firemen would call in to find out where the fire was. Dozens of other people would also call and ask "where's the fire?" even though they knew we were not allowed to give that information. We had to have the switchboard memorized too, in order to be able to answer the firemen first, and we sometimes called the firemen. Local telephones had a little crank on the side and when the caller turned the crank and lifted the receiver the signal went in to the switchboard and a shield dropped down and the line would buzz. The operator would insert a plug into the line and say "number please". There were three switchboards, two for local calls and one for long distance. We were often called upon for things others than telephone service. Sometimes family and medical emergencies would require individual effort such as trying to track down Dr. Foley somewhere up on the North Mountain in a blizzard because someone's baby was on the way. The Canning Heritage Centre (formerly the MT&T Telephone Office), July 2004. Olee Goodwin worked here as a telephone operator in the 1950s. There was a pay phone in the entryway and we had to recognize the sound of different coins when they were dropped in. A 'quarter' had a heavy clunk, a 'dime' jingled and a 'nickel' was somewhere in between. There were no 'loonies' or 'toonies' then. In the early 1950s we could do long distance calls only to Kentville and Wolfville because we didn't have far-reaching equipment. Later we could place calls all over Nova Scotia and I can remember being thrilled to be able to talk to an operator in Cape Breton. Voice signal was not very strong back then and sometimes we had to yell to make ourselves heard and often people at Sherman's Garage next door would laugh at us. I remember, during electric storms, how the equipment rack on the wall next to the switchboard would crackle and snap and we would often get a 'blast' in the ear. Once a large ball of fire came off that rack into the room right behind where I was sitting. It was scary but no-one ever left the switchboard. Sometimes an over-exuberant or perhaps an inebriated customer would give us an unsolicited lesson in profanity or worse, but folk were generally very supportive and pleasant and often gave us chocolates at Christmas time. I can recall a few who were especially nice, such as Bill Rooney who operated a taxi service in town. We sort of unofficially kept track of his calls for him when he was out on a taxi call. He always called us "dear" and appreciated our efforts "above and beyond the call of duty." We got the same nice treatment from Grant Townsend at the Dominion Atlantic Railway Station who had to make a lot of calls about freight, and Gerald and 'Babe' Sarsfield who operated the local meat business and appreciated our service, and many others. Canning was joined to the dial system in the rest of the world in 1958 and even though the service may have been more efficient it lost its personal touch. It was the end of an era.